The global market for email marketing has been influence by a number of factors, among which, the increasing usage of Internet is the most significant one. The expanding penetration of smart phones has also been adding to the growth of this market since the last few years. Over the coming years, the rising awareness among people pertaining to email marketing, such as a relatively higher RoI rate than any other form of digital marketing, will influence its popularity, resulting in a significant market rise. On the downside, the lack of niche marketing options and the privacy issues concerning the usage of Internet and email may act as hindrances, limiting the growth of this market in the years to come. In 2016, the worldwide market for email marketing stood at US$4.51 bn. Expanding at a healthy CAGR of 19.60% between 2017 and 2025, this market is likely to touch US$22.16 bn by the end of 2025. Currently, email marketing is being extensively utilized in the media, IT and telecom, retail/e-commerce, travel and leisure, and the BFSI industries as the primary source of marketing for business expansion purposes and customer retention and satisfaction. North America, Europe, Asia Pacific, the Middle East and Africa, and South America are the prime regional markets for email marketing across the world. Among these, Asia Pacific has acquired the leading position in the global market and is expected to remain so over the next few years, rising at a CAGR of 22.80% between 2017 and 2025, thanks to a relatively faster adoption. The escalating number of internet users and the proliferation of the retail/e-commerce industry in Asian economies, such as China and India, is likely to boost this regional market substantially over the next few years. 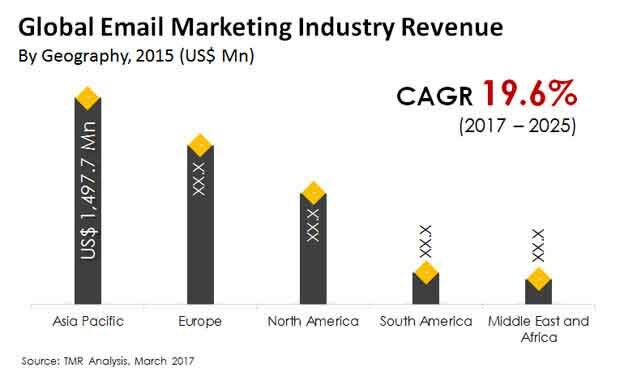 North America, on the other hand, is expected to witness slow growth in its market for email marketing in the near future due to the presence of various regulatory laws. In North America, the U.S. (the CAN-SPAM Act) and Canada (CASL), both, have their respective laws governing email marketing practices; however, the law in the U.S. is more lenient as compared to the one in Canada, which, subsequently is propelling the U.S. market for email marketing. The high internet penetration rate, the rising number of smartphone users, and the steady growth in the BFSI sector may assist the North America market for email marketing to find its way to success in the years to come. Software and services are the main components of email marketing. The software segment has held the leading position in the global market for email marketing and is anticipated to retain it over the next few years, thanks to the increasing adoption of white label software, third-party standard, and web-based application. The third-party standard software is likely to emerge as the most preferred component of email marketing in the next few years. Alchemy Worx Ltd., Adestra Ltd., GetResponse, VerticalResponse Inc., dotmailer Ltd., Forfront Ltd., BlueHornet Inc., Constant Contact Inc., BlueTie Inc., Drip Inc., Microsoft Corp., IBM Corp., The Rocket Science Group LLC, iContact Corp, Zoho Corporation Pvt. Ltd., Salesforce Inc., Responsys Inc., Epsilon, Natexo Group, and Campaign Monitor are the key companies involved in email marketing across the world. This report on the global email marketing provides analysis for the period 2015 – 2025, wherein 2016 is the base year and the period from 2017 to 2025 is the forecast period. Data for 2015 has been included as historical information. The report covers drivers which is driving factor for email marketing industry. It also covers restraints and opportunities for the growth analysis of email marketing. The regional trends covered in the scope of the study expected to influence the global Email marketing growth during the said period. The study provides a comprehensive analysis on market growth throughout the above forecast period in terms of revenue estimates (in US$ Mn) across different geographies. Email marketing is basically used to do advertisements and brand awareness related to products, solution and services. The email marketing has wide adoption across various end-use industry includes retail/e-commerce, IT & telecom, travel & leisure, publishing, BFSI and others for promoting their products, solutions and services and improve customer relationship. Geographically, the report classifies the global email marketing industry into North America, Europe, Asia Pacific, Middle East & Africa (MEA), and South America; the regions are analyzed in terms of revenue generation and also included analysis of countries such as the U.S., Canada, the U.K, France, Germany, China, India, Japan, Australia, UAE, South Africa, Saudi Arabia, Brazil and Argentina. The market size and forecast for each region and country has been provided for the period from 2015 to 2025 along with the CAGR (%) for the forecast period from 2017 to 2025. The report further includes key industry developments in the email marketing industry. Porter Five Force analysis and ecosystem analysis is also included in the report. The report also covers market indicator which provide supporting factor for the growth of the email marketing covered in the scope of study. It shows market attractiveness analysis for all the segments and for all the regions in the scope of study which identifies and compares segments market attractiveness on the basis of CAGR and market share index. The study also includes competition landscape which include competition matrix, market share analysis of major players in the global Email Marketing industry based on their 2016 revenues, and profiling of major players. Competition matrix benchmarks leading players on the basis of their capabilities and potential to grow. Factors including market position, offerings and R&D focus are attributed to company’s capabilities. Factors including top line growth, market share, segment growth, infrastructure facilities and future outlook are attributed to company’s potential to grow. This section also identifies and includes various recent developments carried out by the leading players. Company profile of the key players profiled in the global email marketing industry specifically covers provides company details (HQ, Foundation Year, Employee Strength), market presence of the company by segment., strategy of the company for the growth in the competitive market, revenue and operating profits and SWOT analysis. Key players operating the global email marketing industry companies profiled are Alchemy Worx Ltd., Adestra Ltd, GetResponse, VerticalResponse, Inc., dotmailer Ltd, Forfront Ltd., BlueHornet Inc., Constant Contact, Inc., BlueTie Inc., Drip, Inc., Microsoft Corporation, International Business Machines Corporation (IBM), The Rocket Science Group, LLC (mailChimp), iContact Corporation, Salesforce Inc., Zoho Corporation Pvt. Ltd., Campaign Monitor, Natexo Group, Epsilon, Responsys Inc (Oracle Corporation) and Salesforce Inc.